MUJU, Korea (June 23, 2017) – World Taekwondo was officially launched as its new brand and logo were revealed at the General Assembly that was held a day before the first day of the 23rd World Taekwondo Championships in Muju, Korea. World Taekwondo replaces the World Taekwondo Federation as the name of the global federation and reflects its commitment to evolving and adapting to remain relevant with today’s modern audiences. 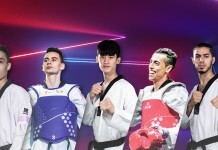 World Taekwondo encapsulates the federation’s values of inclusiveness, universality and excellence while reiterating its position as the undisputed leader of the global taekwondo movement. The new World Taekwondo logo, retains the “kicking athlete” design that was the “T” in the “WTF” as a link to the federation’s great heritage. The “kicking athlete” is colored in the five colors of the Olympic rings against a white background to signify the federation’s position as the leader of Olympic taekwondo and to symbolize the globality of the sport. “Today is an important moment in the history of our great federation. Since 1973, we have been known as the World Taekwondo Federation. Over the following 44 years we have grown taekwondo into the global sport it is today with 208 member national federations worldwide; we have led taekwondo to the Olympic Games and in 2020 will have the honour of seeing taekwondo at both the Olympic and Paralympic Games; and we have reinforced our federation’s position as a global leader in taking taekwondo beyond sport and into the field of humanitarianism. After its official rollout at the 23rd World Taekwondo Championships in Muju in 2017, the new brand will be incorporated in all official communications, marketing materials and branded merchandise.